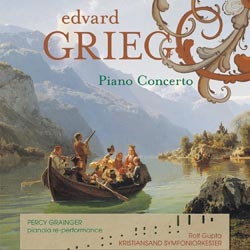 Imagine that a historical recording made by Edvard Grieg back in 1906 is now re-performed on a modern Steinway D and sounds every bit real and palpable. It’s kind of ironic that at this modern time of terabyte hard disk, solid-state drive storage and 32bit/192kHz high definition sound, one of the perfect-sound-forever media for archiving and reproducing music is a paper roll invented more than a hundred and thirty years ago. But of course it’s restricted to keyboard music only and requires a player piano or reproducing piano to bring the music to life. 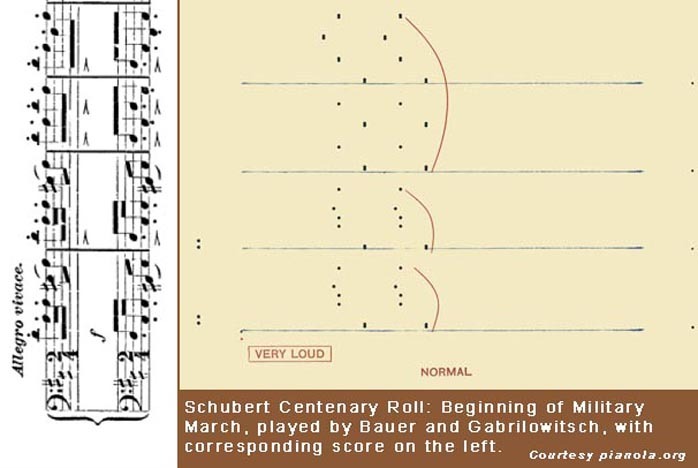 Both the player piano and reproducing piano use piano rolls as their playback medium – round holes for very short notes, long holes (or strings of round holes) for sustained notes. They are operated by suction either from an electric pump or by foot pedals. 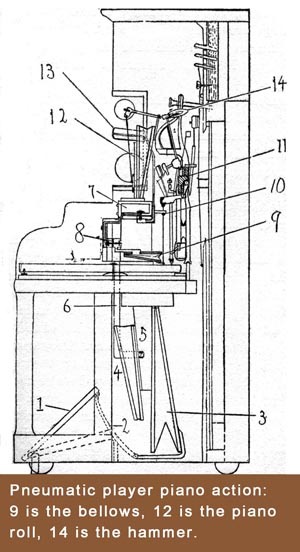 Through a complex network of tubes and valves, the suction presses the keys (and the pedals in the case of the reproducing piano). Attached to each key is a tiny bellows. The piano roll is drawn past a tracker bar which contains a line array of tiny holes corresponding to the notes on the piano. When a hole on the paper roll exposes the hole on the tracker bar, the valve opens and the suction pulls the bellows closed. 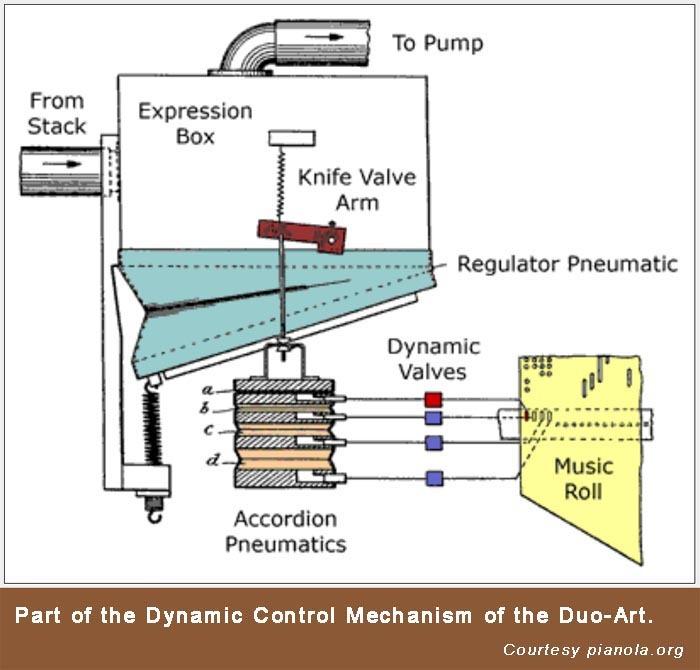 That movement activates the corresponding hammer to strike the piano string to produce a sound. 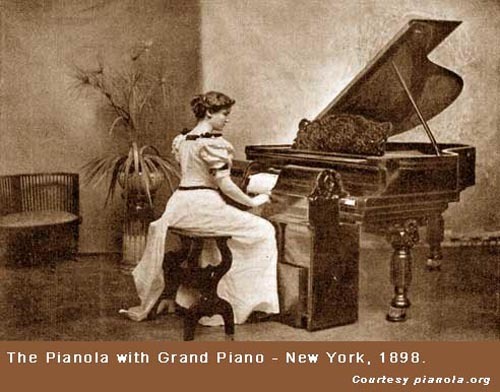 The distinction is that the player piano needs to be properly played to produce changes in dynamics and tempo while the reproducing piano does it automatically. I’m sure you must have seen one of those upright automatic pianos in an amusement park playing ragtime. Kids and adults alike are spellbound by the keyboard that bounces up and down without a pianist. 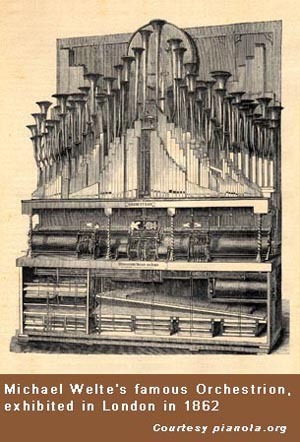 The design was first seen in its infancy in the 1870s and pneumatic reed organ devices began to take shape in the Centennial Exposition of 1876 in Philadelphia. Many years before that in Germany, the orchestrion was invented by Michael Welte (1807-1880) initially using a pinned barrel, though this was later adapted to a paper roll in the 1880s. 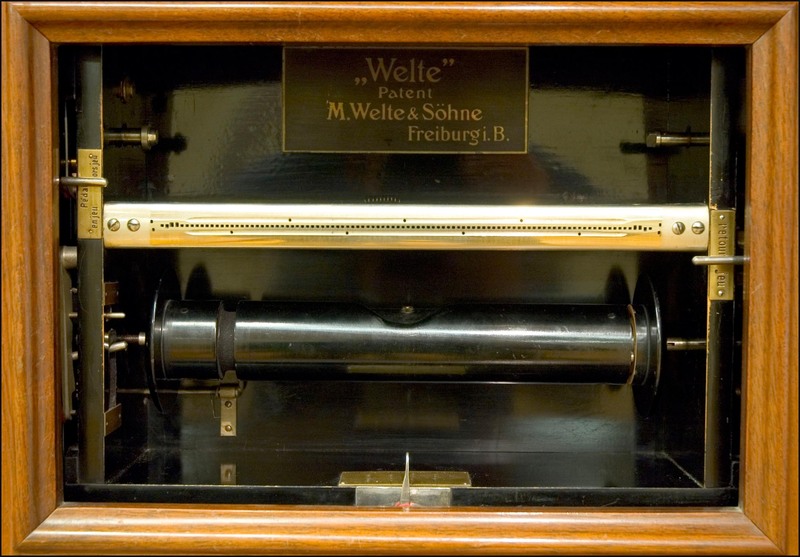 Welte’s orchestrion employed organ pipes and percussive devices to simulate orchestral performances. Considering Edison’s wax cylinder phonograph was first invented in 1877 for telephone recording and much later succeeded by Bell for commercial music applications, the player piano and orchestrion could be said to be the world’s first music recording and reproduction technology. The main advance in player piano technology came in the late 1890s. Edwin Votey, an organ builder from Detroit, invented the Pianola in 1895 and the Aeolian Company in America put it on sale in 1898. It soon spread all over the world and many other manufacturers followed suit. Early instruments were not pianos in themselves but fitted in front of a normal piano, playing it with a set of felt-covered wooden fingers. Later on the mechanisms were installed in normal uprights and grands. The person playing had full control over loudness, tempo and sustaining pedal by means of levers and foot pedals. As the player piano was being further developed, Edwin Welte (1876-1958) and Karl Bockisch (1874-1945) decided to do more. 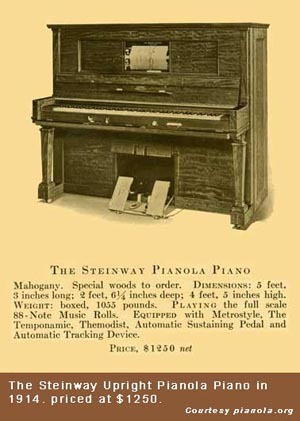 In 1904 they launched the Welte-Mignon, a keyboard-less piano that played recorded performances by means of special music rolls, which ran at a fixed speed. The French word Mignon meaning petite and graceful was adopted for the new product for its relatively small size compared to the firm’s much larger organs and orchestrions. 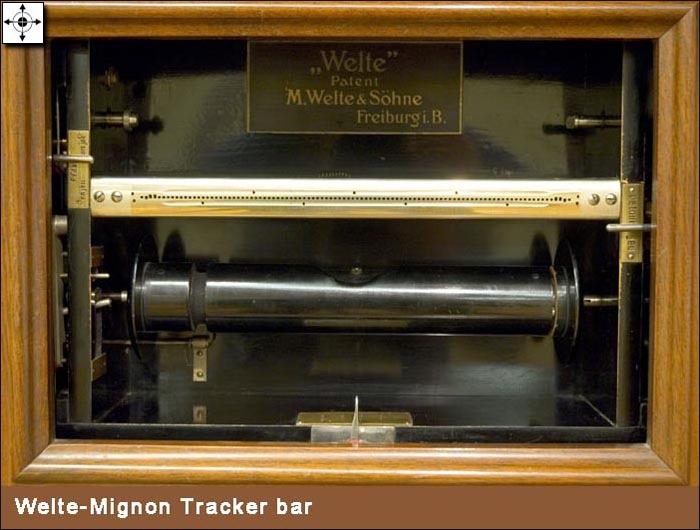 The biggest improvement that Welte-Mignon brought to the industry was in the piano rolls. On both sides of the paper roll, several lines of perforations were added to register expressive nuances like touch, dynamics and pedaling. That helped to make crescendos and rubatos smooth and natural. Their piano add-on model was called “Vorsetzer”—meaning "to put in front of"—and equipped with an expression mechanism that could accurately control the felted fingers to play the most intricate nuances. Pianists and composers who recorded for Welte included Richard Strauss, Enrique Granados, Maurice Ravel and Claude Debussy. Other manufacturers were not slow to follow Welte’s lead. Pleyel of Paris invented their own Pleyela in 1907 and soon attracted a big fan and recording star in Igor Stravinsky. And by 1909 two other European companies were recording rolls for their own systems, the DEA of Ludwig Hupfeld in Leipzig and the Duca of Philipps in Frankfurt. But the Welte-Mignon had also gone on sale in the USA in 1906 and American companies also set about developing their own instruments.